It was lovely to work with Sruthi. My wedding blouse was stitched to perfection. It was a refreshing boutique experience because, I did not have to worry about spending hours explaining what I wanted (which seemed to be the case in many other instances!). She did a splendid job with my sister's blouse too. Would definitely recommend her for a hassle-free, professional designer for wedding blouses. Sruthi is an amazingly talented designer and the final blouses were beyond our expectations. The blouses were also shipped on time and they fit perfectly even though I had only one meeting with her in person. I would definitely recommend her. Sruthi is really talented. Her designs are unique and highlighted one's. It's worth to design a blouse from her.she makes our special day into memorable one through her designs. Sruthi Kannath makes the most beautiful bridal blouses, hands down. Started following her on insta after I stumbled upon her brand somewhere on fb. Went to her to get my first blouse done, and had a satisfying, happy experience. Though I had only a limited wait time, she delivered even quicker than I had required. Very professional, very attentive even to the minute of details. Received many praises for the blouse. Going back now for more beautiful, one of a kind blouses. Ideas, team, attention to detail, patience, creativity and whatever else you want from the one who designs your wedding couture, you find with Sruthi Kannath. Have always been eyeing her designs on the internet with my imaginary fairy tale wedding in head. And she was my go to person as soon my wedding was fixed. 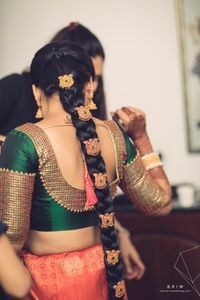 Not only did she take out good amount of time to understand my likes and dislikes, she came up with interesting twists to my ideas and brought out the best designs for the look I wanted. She can always be approached for a status update and her expert opinion on a look. Apart from Sruthi, Oshin was also the sweetest and helped me out patiently when I had gone to pick up the blouses, in trying out and getting the best fit possible. I have been following sruthi from the time I joined instagram. The very first thing I did as soon as my wedding date got fixed was to ping sruthi and book an appointment. I was hardly there in her place for about 10 mins and got my blouse designed. She was that quick and made sure it goes well with the saree. The fitting was perfect and I was really happy. I would highly recommend her. The blouse work was worth the cost and I received so many compliments. Get best quote from Sruthi Kannath and book your date! Check their prices and availability. Send enquiry to your selected list of Bridal Wear at WedMeGood and choose the best. Browse for more Bridal Wear in Chennai and more wedding vendors at WedMeGood and plan your wedding hassle free.